Looking for Windows and doors in Wakefield? Window and Door supplier, fitter and security specialists. We are accredited and qualified, providing guaranteed energy saving replacement UPVC Windows and Doors throughout the Wakefield area. All our windows are ‘A’ rated for energy efficiency. We are also a well-established local locksmith within the Wakefield area with additional 24hr emergency boarding up service should the worst happen! All our new Windows & Doors, Replacement UPVC Windows and doors or Composite doors and maintenance service – comes with a fully backed quality guarantee. "Very pleased with the service provided in helping me feel safe in my own home again after calling for an emergency boarding up service""After an attempted break in John and Kieron came and boarded my window, ordered replacement glass and were back to fit it as soon as it arrived, service was fast pleasant and high quality. John also changed my locks to a higher quality lock to prevent against further attempts. Very pleased with the service provided in helping me feel safe in my own home again"
I sent John a text a few weeks ago to say that I would like a quote for a new front door as I was fed up of my house being freezing because of the draft the was constantly blowing into the house. Within 10 minutes he was at my front door as he was in the area and within another 5 he had measured up and given me a price. The door was installed about a week later to a very high standard and that comes from my dad who for anyone who knows him is a great compliment. Now even in these freezing temperatures I can sit in my living room in a T-shirt rather than the many layers I’m used to. I will not hesitate to tell my friends and family about John’s quality and business. Thanks to the team at Reliable Locks for replacing a faulty anti-snap door lock. The work was carried out promptly and professionally at a very reasonable price. I would have no hesitation in recommending John and his team to my friends, family and colleagues. Found these guys late Thursday night via Facebook and sent them a message for an emergency change of locks. By 7.30am the next day it was all arranged and by 11.30 the job was complete! 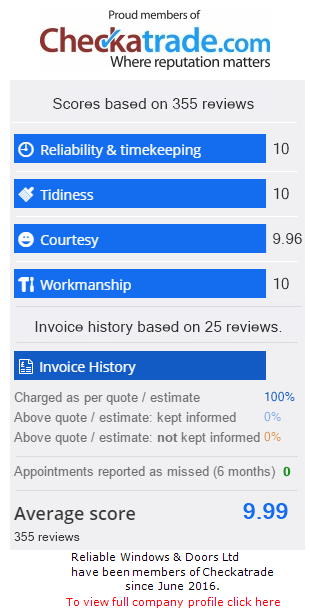 Brilliant service, very friendly and professional. We have just had all of our windows and doors replaced by John, Richard and Helen. From day one of meeting John and Helen they have been friendly and professional, accommodating our preferences and styles. John managed to source and provide a particular style we had found which wasn't advertised in his booklet, this was greatly appreciated. During the fitting all mess was tidied every evening before leaving by either John or his wife Helen with each room. Although, the job ran over the estimated time frame, it was not rushed and the price remained the same as the quote provided. We found the company to be very competitive in price and they have fitted our windows and doors to a very high standard. We highly recommend. We have just had 11 windows and 2 doors replaced by John and his team. We are "highly delighted" with the way in which the work was carried out. The work was completed to an extremely high standard earlier than the time specified with great care, attention and the minimum of disruption. John, Helen and Dan were very polite and friendly, left everything neat and tidy when the work was completed. I would not hesitate to recommend John to anyone. John and his team did an excellent job recently replacing some failed window units at my office and home. The work was carried out professionally, on-time and at the price agreed. John also recommended some more advanced locks for my office which were installed on the same job. I would not hesitate to recommend Reliable Locks and Windows. Please use the following form to send an enquiry to Reliable, or if you would like to request a brochure or a call back from John about any of the Reliable services. Please contact us for more information about any of our services. We’d love to help!